The bridge over the Victoria Falls was until recently the setting for the highest bungee jump in the world, at 364ft (111m). This jump is renowned for its adrenaline rush as you stand far above the turbulent water looking down into the gorge below. Although no longer the highest, this jump certainly still has one of the most beautiful settings in the world. The Victoria Falls Bridge lies in 'no man's land' between the Zimbabwe and Zambian border posts and is therefore easily accessible from both countries - immigration officials will issue a Gate Pass for jumpers and spectators. 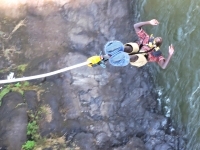 There is also the option of gorge swinging instead of bungee jumping, but this adrenalin-pumping alternative is undertaken nearby on the edge of the gorge, not off the bridge.